The next item on my to-do list is “write words of thanks for honour of being Morris finalist,” but while I am both grateful and honoured, I am also exhausted. I spent five hours cooking today, for a party I am holding tomorrow after – note! – my signing at Melbourne Borders Central at 2pm. I don’t think I am in a fit state to compose a message that adequately conveys my sincere gratitude. Instead I would like to have a serious discussion of pie. 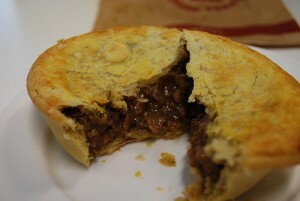 That is a steak and onion pie from venerable Australian chain store Brumby’s bakeries. Om nom nom delicious gravyness. 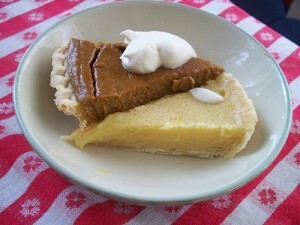 That is apparently pieces of pumpkin pie and lemon chess pie. Internets, you are smart. 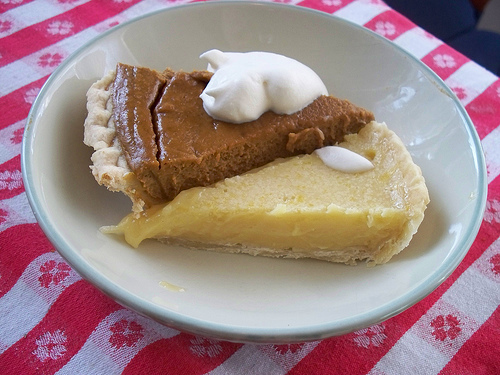 You probably knew the pie/pie differential already. 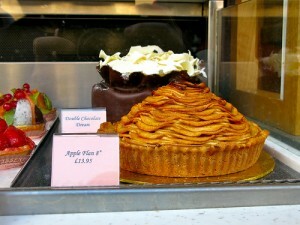 But you may not have known that the confusion does not stop with pie, but extends to foods in the pie family. Once upon a time, I was eating at a very good Mexican restaurant in Tucson with BFF Robyn. 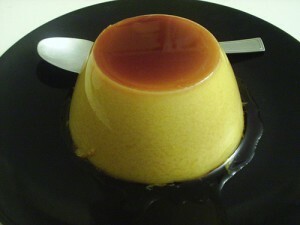 Undefeated by the awesome chicken mole, we both ordered flan for dessert. It was yummy, I GUESS, but my expectations had been dashed, and I was very sad. 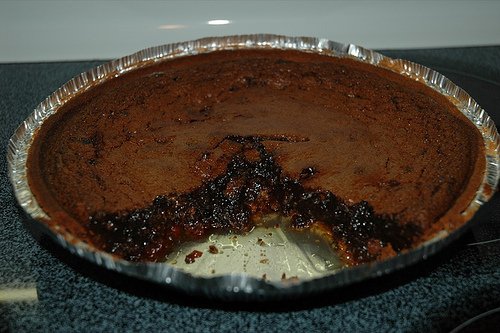 Of course, I think it can be generally agreed among people who are fond of both chocolate and coffee (eg, me) that the best pie of all is John Scalzi’s Schadenfreude Pie. Much like John himself, this pie appears to be composed of equal parts sweetness and high-grade evil. I have not yet dared to make it, but when I do, I confidently expect the earth to tremble, ever so slightly, at its unholy inception.